Global digital agency 'We Are Social' and Hootsuite have just released their report on the state of internet around the world as of January 2019. Based on their findings, there are now 4.39 Billion global netizens and 3.48 Billion of them are active in social media. These figures both represent a 9% increase coming from 4.24 Billion and 3.19 Billion in January 2018, respectively. 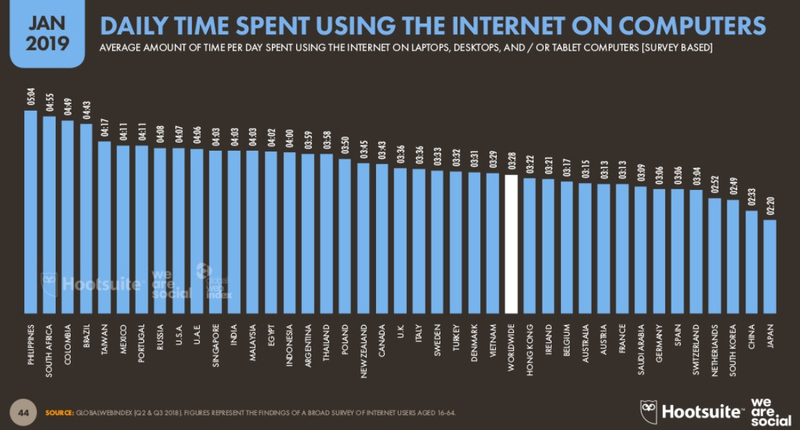 Incredibly, according to GlobalWebIndex - one of the sources for this study, the Philippines currently leads all countries in terms of number of hours that users spend using the internet. Compared to the global average of 6 hours 42 minutes, Filipinos surf the web for a whopping 10 hours 2 minutes per day, using online apps and browsing websites, among other online activities. All graphics presented in this TechPinas post are courtesy of Hootsuite and We Are Social. 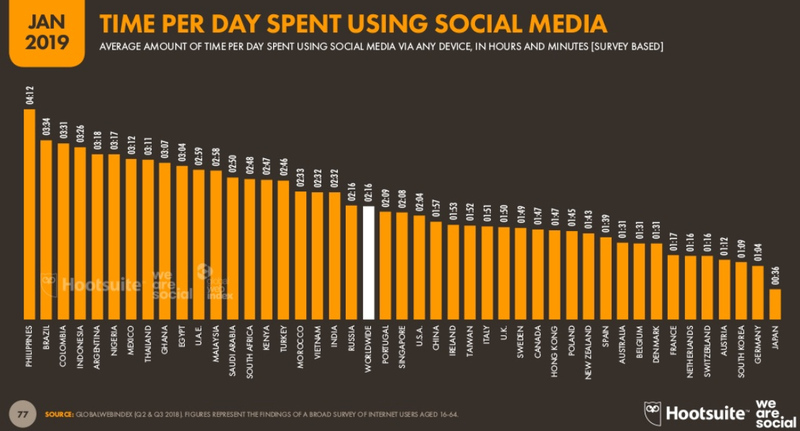 Every day, on average, Pinoys check and update social media applications and sites for 4 hours and 12 minutes, which is almost double the amount of time that internet users in the United States spend using social media. In fact, the Philippines and Japan appear to be outliers in the graph on opposite ends of the spectrum -- as shown above. These "feats" are particularly amazing when we consider the fact that the Philippines is one of the nations in the world that have the slowest internet speeds. 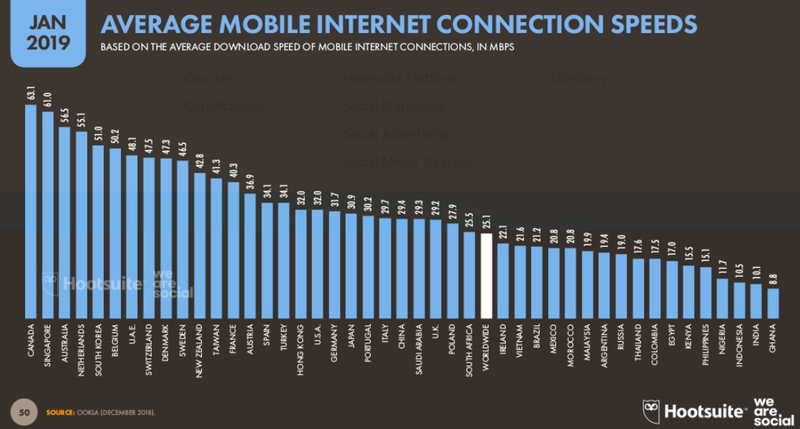 For mobile data connectivity, Pinoys only enjoy an average download speed of 15.1 Mbps, which is ranked 5th slowest globally in this regard. 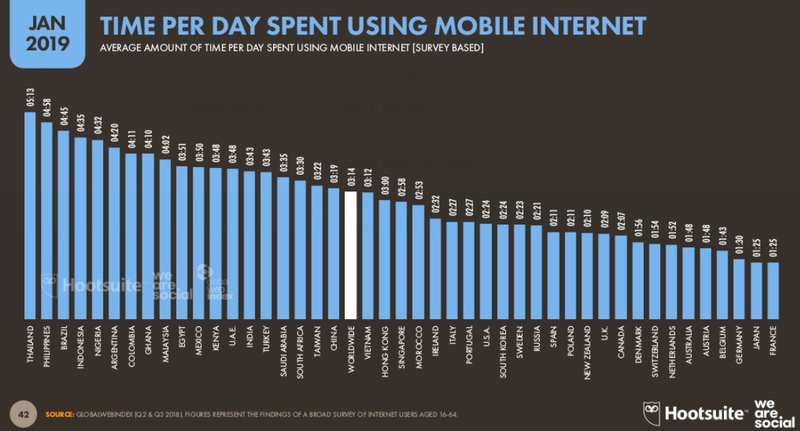 Despite that, the Philippines managed to land at the #2 spot when it comes to the amount of time that users spend on average surfing the web using mobile data. 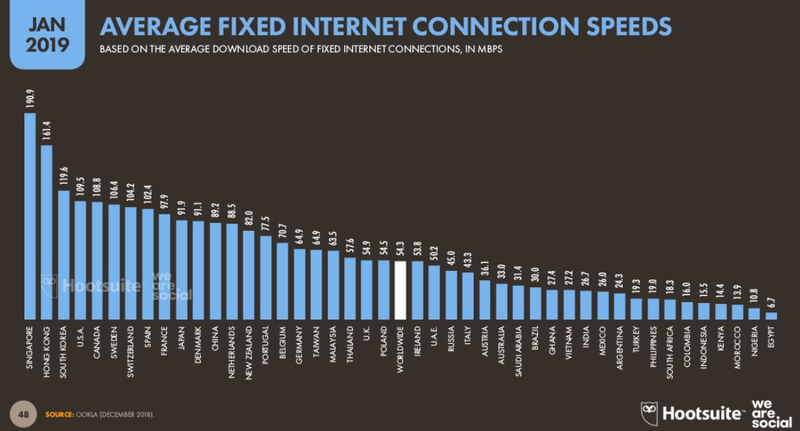 At 4 hours 58 minutes, the Philippines trails only our neighbor Thailand, which - interestingly enough - is also in the list of 10 countries that have the slowest mobile data speeds. Compared to mobile data, our wired or fixed internet download speeds are a bit faster on average at 19 Mbps -- but it's still the 8th slowest in the world as of January 2019. 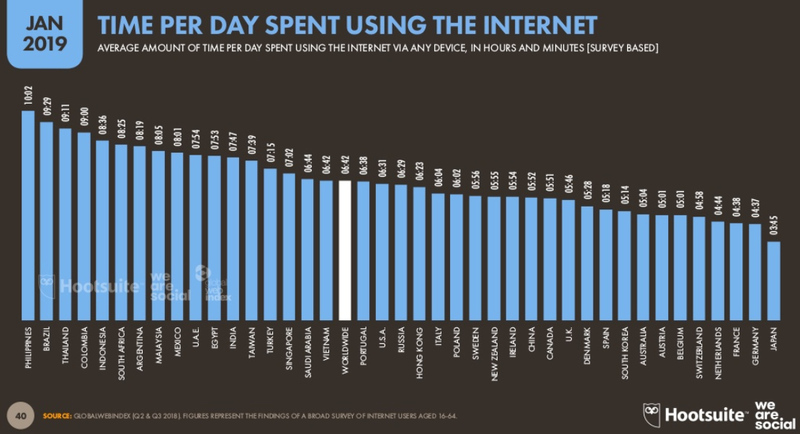 Incredibly, however, Pinoys stay online using wired connection for 5 hours 4 minutes on average per day, which puts us at the #1 spot worldwide in this department. 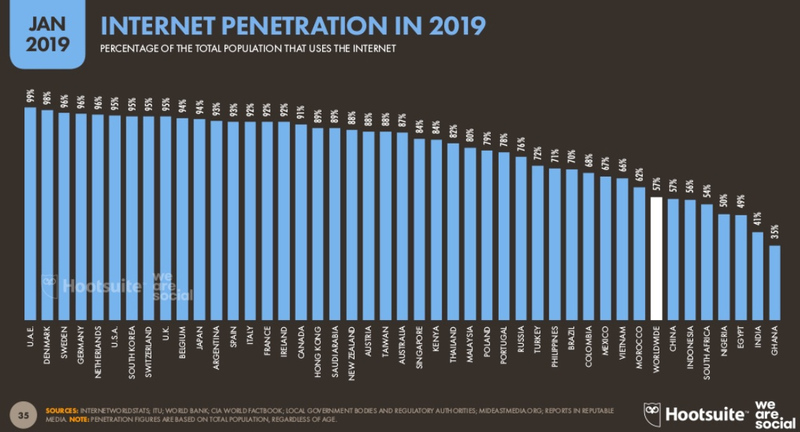 Clearly, despite not being able to enjoy the fastest connectivity speeds, Filipinos obviously love surfing the web and staying in touch with each other through social media. 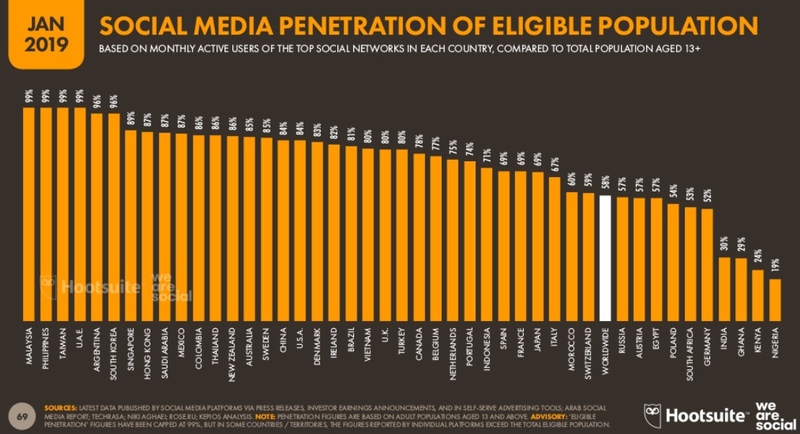 In fact, we are currently in a quadruple tie with Malaysia, Taiwan, and United Arab Emirates at the top position in terms of the percentage of the population aged 13 years old and above who are actively using various social media platforms. What do you think about the current state of internet in the Philippines? Is our top position in terms of average time spent using internet and social media a good or bad thing? What do these figures show about Filipinos as netizens? Share your thoughts with me via our comment section below or by messaging me on Facebook, Twitter, or Instagram.